Celebrations along Florida’s Treasure Coast were decidedly muted yesterday, thanks to a putrid, toxic algae bloom that continues to fester days after Governor Rick Scott declared a state of emergency. 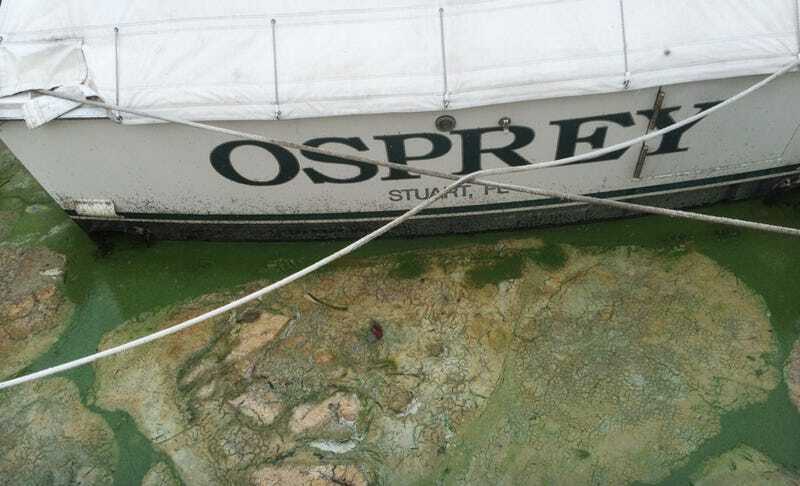 Described as “rancid” and “guacamole-thick,” one of the worst algae blooms in recent memory has spread across coastlines and seaside inlets in Florida’s Martin, St. Lucie, Palm Beach, and Lee Counties, filling the air with a foul stench. Residents, who are complaining of headaches and respiratory problems and have been seen sporting breathing masks, are being advised to stay out of the sludgy water, as if they needed help figuring that one out. The nightmare traces its origins to nearby Lake Okeechobee, where the US Army Corps of Engineers recently began a controlled discharge to prevent excessive flooding. The lake water, laden with agricultural pollutants from farms to the north, causes bright green algae to flourish as it flows downstream. Residents are understandably upset about the Army Corp’s actions, but the situation is complex and mired in South Florida politics. If the lake overflows—and it’s very close to doing just that after a year of heavy rain—it could cause “widespread damage and problems” to the south, Army Corps spokesperson John Campbell told the New York Times.